Soon after they landed on a Saipan beach, 4th Division Marines are hit with fire power from waiting and hidden Japanese soldiers. Photo included in Saipan: The Beginning of the End, a USMC Historical Monograph by Major Carl W. Hoffman, USMC, at page 57. Public Domain. Saipan is the largest of fifteen islands in the western Pacific Ocean known as the Marianas. Japanese forces held the strategically significant island on 15 June 1944 when America launched its amphibious attack. A magnificent drawing of Saipan’s Tanapag Harbor, by Hans Mangelsdorf, is part of the Army’s Art Collection. It depicts the massive forces that were launched to capture the island. The Empire’s hero of Pearl Harbor, Vice Admiral Chuichi Nagumo, was in command of Japanese forces. It would be his last battle. 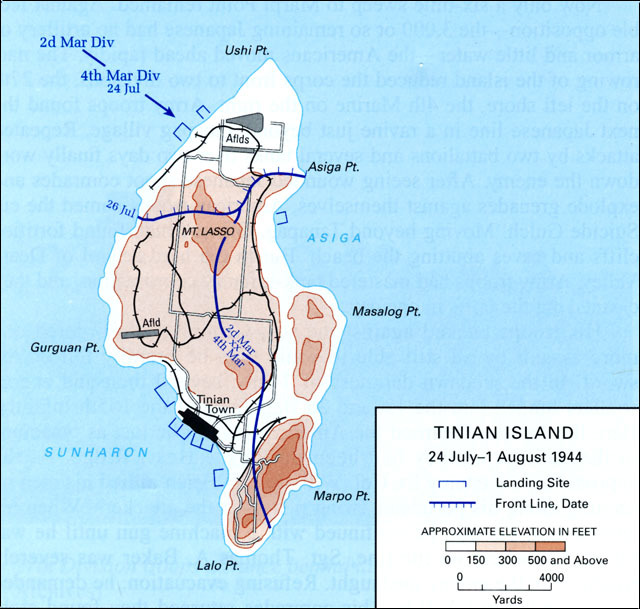 Tinian Island, the starting point of Enola Gay’s atomic bomb run to Hiroshima, is about three miles south of Saipan. It would also be the site of fierce battles during the summer of 1944. Enemy guns were trained on the beaches as the first wave of Marines to hit the Saipan beach took cover behind a sand dune. They had to wait for their attack orders until the next three waves of Marines had arrived. Crawling under an avalanche of bullets, they tried to take their assigned positions. Sailors on the USS Monterey, meanwhile, made sure they had enough food to get them through the long hours ahead. Marines, using captured oxen and carts, transported supplies to the front lines. 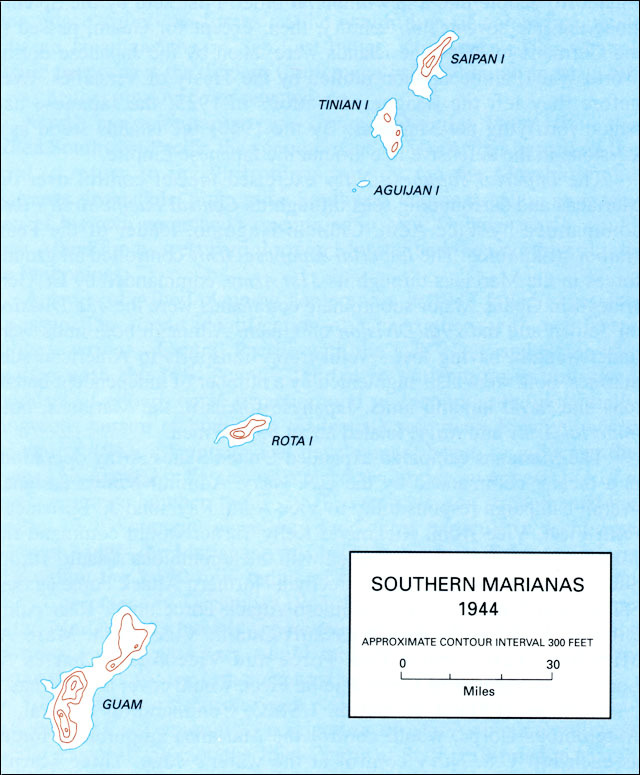 Army reinforcements from the 27th Division disembarked from LSTs and moved across the coral reef toward Saipan’s beach. Those who made it ashore were able to advance behind their tanks. Some Americans took refuge in bunkers. A Marine Corps patrol found a Japanese mother and her four children hiding in a hillside cave. They had taken shelter from the fierce fighting near their home. Another Marine rescued a tiny infant, still alive, in a ravine. He passed the child from Marine to Marine until the baby reached medics who could try to help. Bos, Carole "AMPHIBIOUS ASSAULT on SAIPAN" AwesomeStories.com. Jun 01, 2002. Apr 26, 2019.